HOT DOG DAYZ!!! 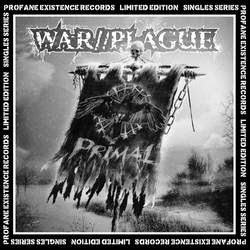 : Record Review: WAR//PLAGUE - Primal 7"
Record Review: WAR//PLAGUE - Primal 7"
WAR//PLAGUE always come a little different each time out. Primal is their fifth release and one that shows the Minneapolis quartet stripping away the evolved crust and blackened characteristics of their previous material in favor of a sound that is more, well, primal. As a band that’s been known to write some really politically and environmentally charged songs, WAR//PLAGUE seem to have purposefully dumbed down the lyricism a bit this time around. And that’s A-OK. Sometimes you just need to satisfy that primordial instinct to grunt your way through some headbanging. What Primal lacks in meaning, it adequately makes up for in mosh. ...Read entire review at this place.